Toronto, or the big apple of Canada, as I like to call it, imminently reminded me of a younger sibling of New York City, with that resemblance of hustle and bustle and huge skyscrapers, just on a slightly smaller, Canadian scale. I'd been to Toronto several times in the past, once during a snowstorm in March which left me realizing that I could never, and I mean NEVER, relocate to this cold, seemingly uninhabitable land. But I'd never been out east during the summer, and so I packed my things – very lightly – expecting to be undertaken by the intense humidity and heat. Humidity at bay from what appears to be a "late summer" as the locals are saying, we threw on what we could manage to keep relatively warm, checked in, and went out for to celebrate Canada Day – or as you might know it on social media by now, #Canada150. Happy 150th Canada! The food. Toronto has some incredible food as well, which you might discover on a tour through Kensington Market like we did with Tasty Tours. 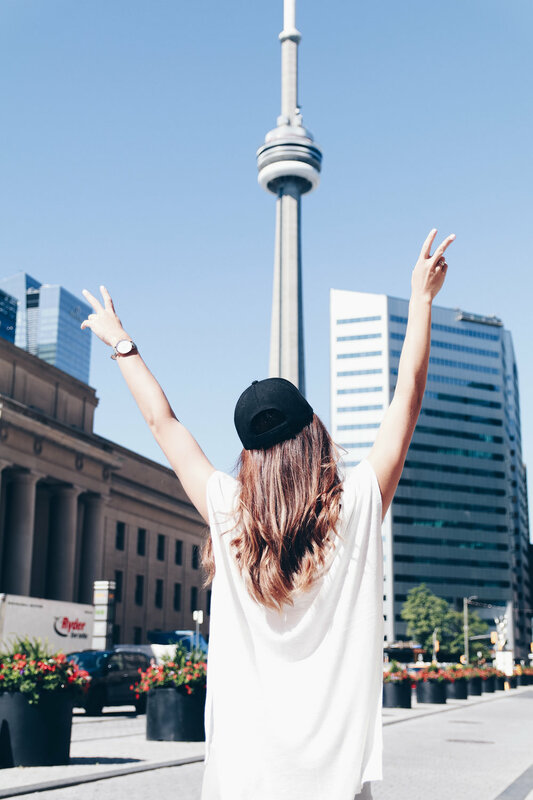 I'd highly recommend this tour on your visit to Toronto – it's so great to be able to learn about the history of a place, its food, and its culture, all while nibbling and tasting the flavours along the way. I particularly enjoyed Moo Frites, a poutine joint inspired by the frites with mayonnaise in Amsterdam. Brought me back! Toronto Island, maybe. We weren't able to visit Toronto Island during our visit as it happened to be basically underwater from all the flooding, but I do look forward to visiting what I hear to be a gem of a spot on our next visit. The diversity and friendliness. The people in Toronto come from all walks of life, and unlike the snobbier Vancouver, are incredibly friendly. It's pretty eye opening what a simple conversation with a couple of strangers sitting next to you at a bar can do for your sense of wonder, curiosity, and intrigue to that general thing we call life, and I found the people in Toronto to truly bring out this side of me as well. I'd recommend booking with Skyscanner to ensure you get the cheapest flight to Toronto, for the best days possible. It can be hard to justify spending an arm and a leg on a domestic flight to Toronto, when a flight abroad to Europe would cost about the same if you aren't careful, so be sure to do your homework! PS. AirTransat has an awesome direct flight to Toronto from Vancouver.